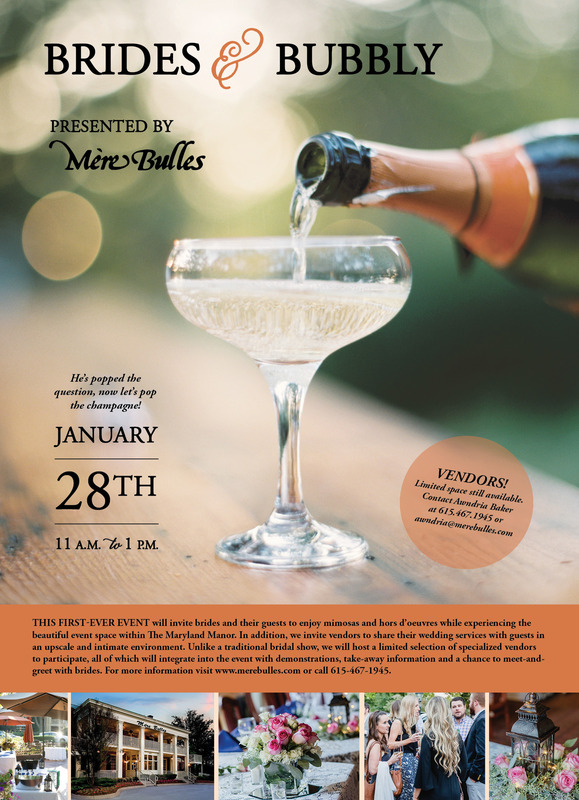 Join us at Mere Bulles on Saturday, January 28th • 11 a.m – 1 p.m. This first-ever event will invite brides and their guests to enjoy mimosas and hors d’oeuvres while experiencing the beautiful event space within The Maryland Manor. Unlike a traditional bridal show, we will host a limited selection of specialized vendors to participate, all of which will integrate into the event with demonstrations, take-away information and a chance to meet-and-greet with brides. For more information call 615-467-1945 or email awndria@merebulles.com. Reservations preferred but walk-ins are welcome!